The holidays are just around the corner, and let me guess…you’re wondering what to get the foodie in your life, am I right? Well never fear, our Holiday Foodie Gift Guide is here! This post contains affiliate links, which means if you make a purchase, we receive a small commission (without it costing you a penny more!). To learn more, please visit our Disclosure Policy. Most of us love food. Well, some of us more than others, ha! So when it comes to holiday gift giving, why do we so often gravitate towards gifts that seem like they’re more ‘for show’ than anything else? After all, gift giving shouldn’t be about who buys the best or most expensive present. It’s the thought that counts, right? So why not give a food lover something they will actually get excited about….FOOD! Whether your family member or friend is into cooking, yummy treats or my personal favorite, chocolate…we’ve found a variety of gifts that we’re sharing below. You’re sure to find something for that special someone on your holiday shopping list. Who doesn’t love chocolate, am I right? Take a look at the gifts below that any chocolate loving foodie would be thrilled to receive! My kids absolutely love Lindor Truffles! So when I discovered that you can create your own one-of-a-kind gifts at Lindt with their Lindor Custom Mix, I was stoked! You get to choose from 20 Lindor flavors, select your gift recipients favorites and even choose the container they’ll come in. They have so many yummy flavors like Coconut, Hazelnut, Caramel, Orange, Mint, Raspberry, Vanilla and more. Right now get 35% off Sitewide when you use the code LINDTFAMILY at checkout! One of my favorite cookies has to be Mrs. Fields. 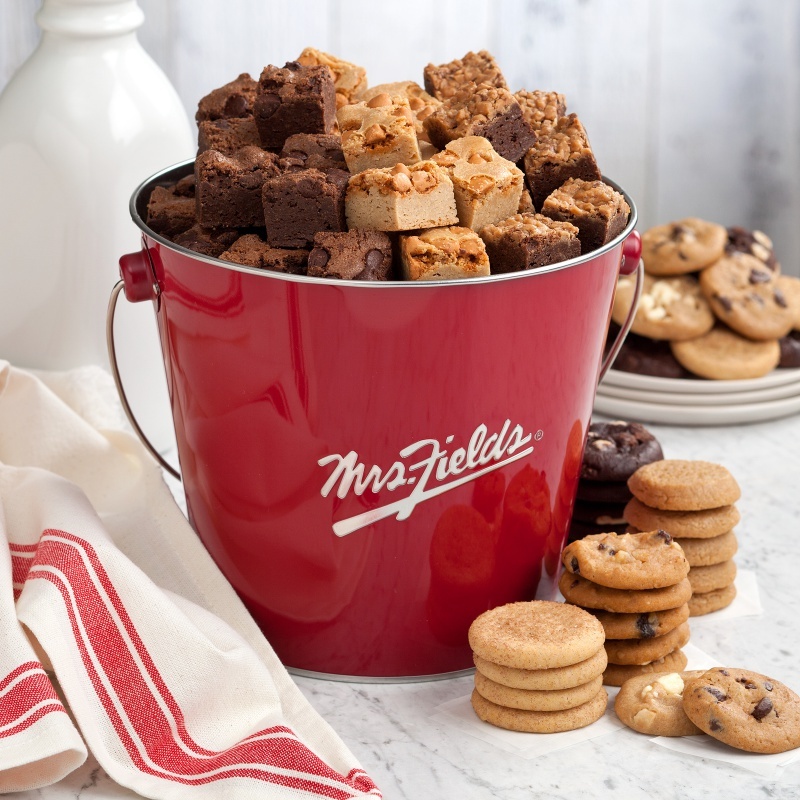 When my husband and I were first dating, we used to go to the mall and would always leave with a cup full of Mrs. Fields Cookie Nibblers, they’re so yummy! 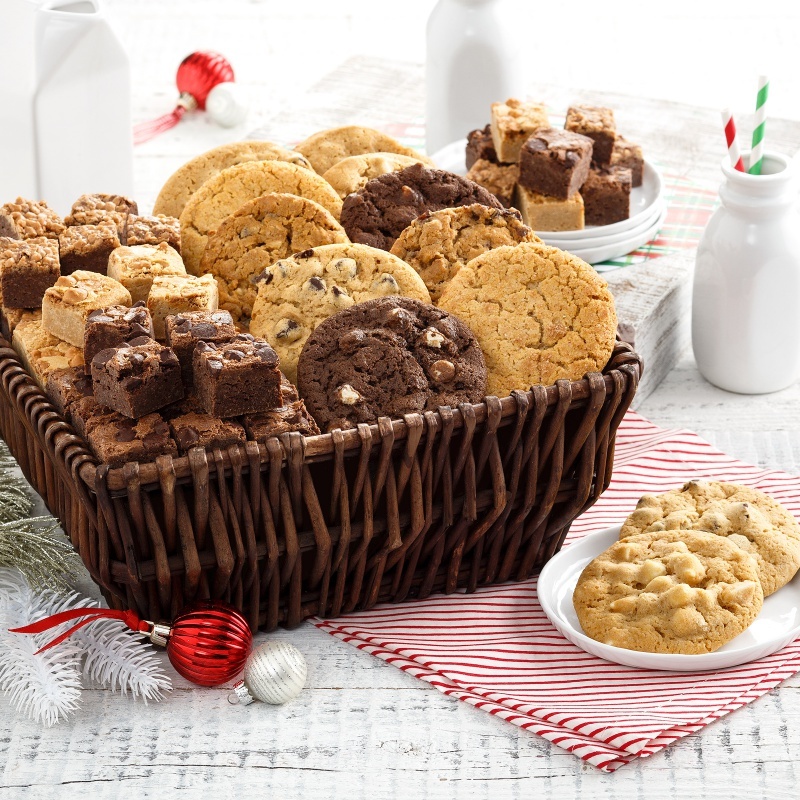 You can now get the best cookies in a box, tin or pail that’s perfect for gift giving on any occasion. The Signature Tub is one of my favorites, pictured below. Cookies are also such a great gift selection as many people like to bake during the holidays. Our family makes homemade Christmas Cookies every year and the kids just love it. There are usually so many that we have to put some on a platter or in a tin for gifting. Mrs. Field’s also offers a wide variety of Gift baskets. Here are a couple of their best selling gift baskets any foodie is sure to love. Different types of their famous brownies are a chocolate lovers dream! Each Jumbo Cheese and Fruit Basket includes Honeycrisp, Gala, Fuji and Granny Smith Apples, Kiwi, Mango, Oranges, Bosc Pears, Smoked Gouda Cheese, Vermont Cheddar Cheese and Multi-Seed Flatbread Crackers. Also a variety of nuts. Perfect for the health conscious foodie in your life. Yes, you read that right, I’m recommending meat as a gift! Just ask any guy if he’d like to receive a gift of meat, and I bet you a dollar to a donut he’ll say yes! That’s where Omaha Steaks comes in. They have all kinds of meat…burgers, sausage, roast, poultry, bacon…and yes, steak! They even have seafood, sides, desserts and wine! Also, don’t forget to shop through Ebates as Omaha Steaks is a participating retailer. The amount of cash you get back varies, but right now as of this post it’s 7%, which is pretty good. Most people love going out to eat (I know my family does!). What better gift for a foodie than a gift card to their favorite restaurant? You might even give them a card to a restaurant they’ve never tried before so they can have a new experience. I love this gift option for a several reasons. One, it gives the recipient a night off from having to worry about dinner (or breakfast, or lunch…you get the picture). Two, it encourages time spent with family, friends and loved ones as most people aren’t going to go out and eat alone. So you’re really giving them an experience. Three, you can support your local restaurants as most of them will be offering gift cards or gift certificates of some sort around the holidays. I know we had friends give us an Olive Garden Gift Card one year for Christmas and we loved it. After all the holiday cooking it was nice to take the family there and have a delicious meal. I didn’t put this under chocolate above because although chocolate is candy, candy is so much more than just chocolate. Makes sense, right? A true candy lover will appreciate the variety that Candy Club has to offer. You can read about my experience trying out Candy Club here. Link to candy club post. They have everything from chocolate covered nuts, to gummies, to licorice and sour candies. Definitely something for everyone! Now the thing I want to mention about Candy Club is that it is a monthly subscription. This means you’ll either have the option of making your gift last for months (or however long you want to keep the subscription active) or cancelling after the shipment of your first gift. The choice is yours, but either way, it’s wonderfully delicious candy that your gift recipient is going to love! EXCLUSIVE OFFER! $15 off! Shop now! When it comes to giving food as a gift, there are so many options. You can make homemade food gifts that your friends and family will appreciate. But if baking and cooking aren’t your thing, there are so many choices online that make great gifts for foodies. Be sure to visit Amazon as well as they have everything (as I’m sure you already know) from Nut Gift Baskets to Pretzel Gift Baskets and so much more. I hope this Holiday Foodie Gift Guide has given you some great ideas about what to get the foodie in your life. Have anything to add? Leave us a comment below, would love to hear about which option is your favorite. And if you enjoyed this post, please pin it! Peppermint bark from Williams sanoma it just isn’t Christmas in our house without it!